Tragically, he was assassinated only a few days later, leaving his colleagues in the struggle — iconic civil rights activists like Rev. Ralph D. Abernathy and Bayard Rustin — to take up the cause and organization of the campaign. As the Poor People’s Campaign undertook their quest to the capital, the organizers built up a multiracial coalition of activists and participants including poor white coal miners, Chicano farmworkers, and Native Americans. For 42 days, three thousand people camped on the National Mall in a tent settlement they called Resurrection City, bringing the needs and demands of the poor to the White House steps and to administration officials. The Poor People’s Campaign demanded an Economic Bill of Rights, which included policies such as guaranteed basic income, massive increases in public housing, and $30 billion dollars pledged toward government anti-poverty initiatives. On June 19, 1968, fifty thousand gathered for a Solidarity Day rally and march to the Lincoln Memorial. However, just a few days later, on June 23rd, the permit the organizers obtained to set up Resurrection City expired, and the government wasted no time in evicting and arresting participants on June 24th. The protestors’ demands were not met in full, although in the years following the dismantling of Resurrection City more federal funds were allocated to social safety net programs like rent subsidies and anti-hunger programs. Nevertheless, the promise and legacy of the Poor People’s Campaign continued to inspire and instruct social justice advocates. In 2018 though, even these basic, inadequate welfare protections are under attack. While lawmakers enthusiastically pass tax cuts for the ultra wealthy, elected officials and bureaucrats are united in an effort to defund nutrition assistance colloquially known as “food stamps,” raise rents in public housing, and make healthcare even more difficult for poor people to access. It is in the midst of this assault on the poor and working class that the new Poor People’s Campaign: A National Call for Moral Revival officially launched after years of researching the nature of poor peoples’ plight across America. It began its 40 Days of Moral Action, a 6 week direct action and community building effort based on weekly themes, on May 14, 2018. It was also on that day that members of an all-volunteer run, New York city based organization called Sadhana participated in a kickoff rally at the state capitol in Albany. Sadhana is a volunteer-run organization of Hindus who identify as progressive and see within their faith an endorsement of an outwardly focused spirituality wedded to social justice concerns and compassion for all. Sadhana’s religious stance is posed in opposition to Hindutva (Hindu nationalism) and its rising international political profile. The members work on initiatives as varied as promoting environmental justice and local stewardship of nature sites; combating casteism in their communities and religious institutions; providing immigrants rights workshops to the public; and hosting forums about interfaith harmony and ending gendered violence. The Poor People’s Campaign: A National Call for Moral Revival professes an intersectional outlook on the causes and effects of poverty. It demands the rollback of voter suppression laws, rechanneling the defense budget into social welfare programs, recognizing Native Americans’ sovereignty over their lands, a “Medicare for all” healthcare system, and an end to mass incarceration, among many other policy planks. While the leaders of the Poor People’s Campaign at the national level, the Revs. William Barber II and Liz Theoharis, base their call for a “moral revival” and social justice on Christian scripture and aspects of liberation theology, people from all faith traditions (or none at all) are welcome in the movement. On a local level, the communities Sadhana works with are directly affected by anti-poor and racist government policies. Sadhana noted in a recent press release that while South Asians are often viewed as a monolithic “model minority” in American society, many South Asians of all national backgrounds are living in poverty. In a 2013 study of New York City’s Indo-Caribbean immigrant (foreign-born) communities, data showed that as many as 15% of Trinidadian and Guyanese immigrants lived in poverty, a not insignificant proportion. Udit Thakur, an organizer with Sadhana and the lead coordinator of its involvement in the new Poor People’s Campaign, explained to Kajal over the phone that the temples that Sadhana collaborates with primarily are located in Brooklyn and Queens, areas home to large Indo-Caribbean populations. There is another obvious ideological thread connecting Sadhana to the Poor People’s Campaign, and that is the loyalty to the concept of nonviolent resistance. The pursuit of nonviolence is a legacy of Dr. King’s leadership throughout the Civil Rights Movement, and it is a practice historians have shown was inspired in part by the tactic of satyagraha (“truth force”) pioneered by Gandhi in South Africa and during the Indian Independence movement. The writer Priyanka Kumar has noted that King “began to refer to Gandhi as ‘the guiding light of our technique of nonviolent social change’” during the Montgomery Bus Boycott of 1955-56. (It would be remiss to point out this shared revolutionary approach without acknowledging, in the interests of historical accountability, as recent scholarship has shown, that Gandhi did harbor anti-black attitudes early in his career.) Sadhana has acknowledged this shared historical inheritance of nonviolence and endorsed the approach of the new Poor People’s Campaign. An exciting moment came for Sadhana on June 19th, when the Bhavanee Maa Mandir, a temple in Brooklyn, NY became the first Hindu temple to go public with its affiliation and endorsement of the Poor People’s Campaign by hosting one of the movement’s Truthful Tuesday discussion and reflection sessions. At that meeting there were speakers from participants and Poor People’s Campaign organizers including those who self-identified as Jewish, Christian, Hindu, and secular. They spoke about their own journeys to progressive activism, as well as about the urgency of mobilizing against the cruelties being perpetrated at the southern border on immigrant families and their children. Over snacks and samosas, attendees discussed civil disobedience actions they had taken part in at the Capitol in Albany. 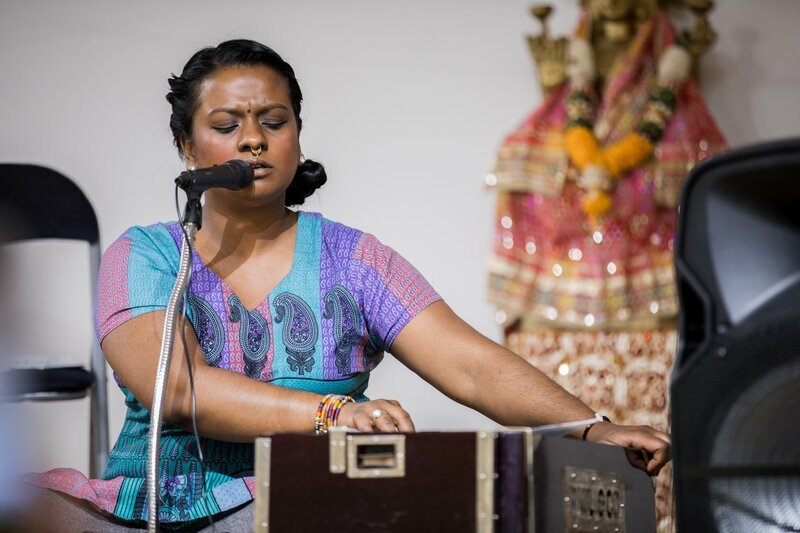 When asked about this event’s importance to Sadhana personally, Thakur reflected, “It was a landmark in the sense that we were very intent on having this show a message to folks in our immediate community, and to use it as an opportunity to grow. It was meant to inspire and set an example for other temples, that folks can lead by example.” He stated that other temples in the community were also aware of the Poor People’s Campaign, even if they were not as public about their involvement as Bhavanee Maa Mandir. The hope is that going forward, those who want to have similar conversations in their own local temples will feel encouraged and empowered to organize. On June 23rd, the fiftieth anniversary of the last day in the life of Resurrection City, a new rally was held in DC called the Stand Against Poverty Mass Rally & Moral Revival. According to the Campaign, the rally was not meant to be an end as much as a marker of a new phase in the movement. What the future holds is not yet clear, but Thakur, who along with other members participated in the rally, emphasized that Sadhana is in it for “the long haul.” The Campaign, given its broad geographical sweep, understands and encourages local activists to approach the movement from a bottom-up, locally relevant set of concerns, he explained. This “less glamorous work,” Thakur claimed, is what will lay the groundwork for substantive, and sustainable, social and political change.